ePosters - A new biotransformation prediction engine integrated into a metabolite identification solution. 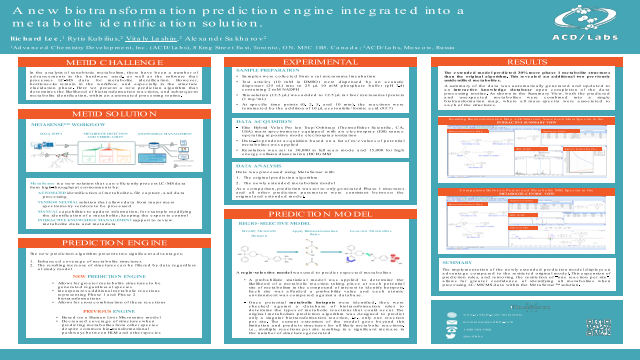 Poster Title: A new biotransformation prediction engine integrated into a metabolite identification solution. Abstract: In the analysis of xenobiotic metabolism, the main analytical platform for studying experiments is liquid chromatography coupled to a high resolution mass spectrometer. There have been a number of advancements in the hardware used, as well as the software that processes these data. However, bottlenecks remain in the workflow and especially in the structure elucidation phase. A new prediction algorithm was developed to aid in the identification of possible metabolites within an LC/MS dataset. The work presented here describes the integration of new prediction methods that determine the likelihood of biotransformation reactions, and subsequent metabolite identification within an automated processing routine.Summary: In the analysis of xenobiotic metabolism, there have been a number of advancements in the hardware used, as well as the software that processes LC-MS data for metabolite identification. However, bottlenecks remain in the workflow, and especially in the structure elucidation phase. Here we present a new prediction algorithm that determines the likelihood of biotransformation reactions, and subsequent metabolite identification, within an automated processing routine.